Designing is never a solitary act. So it's important that everyone is on the same page. This technique guides you in a value negotiation with all stakeholders involved in order to find common ethical ground. Designing is hardly a solitary act. So it's important that everyone is on the same page. This technique guides you in a value negotiation with all stakeholders involved in order to find common ethical ground. 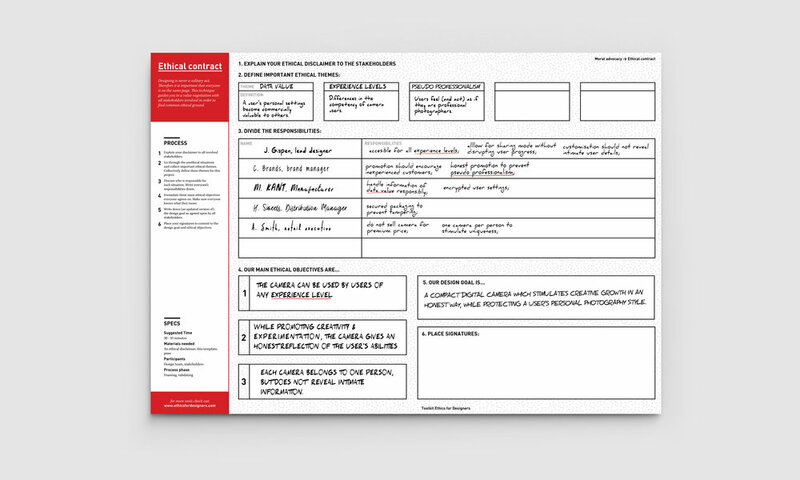 The ethical contract tool consists of 6 steps. Explain your ethical disclaimer to the stakeholders. Look for recurring themes in the disclaimer and agree on a definition. Divide the unethical situations among the stakeholders and add any missed responsibilities. Summarise the responsibilities in 3 main ethical objectives. Update the design goal, making sure all stakeholders agree. Place your signatures to commit to the design goal and ethical objectives. Explain your disclaimer to all involved stakeholders. Go through the unethical situations and collect important ethical themes. Collectively define these themes for this project. Discuss who is responsible for each situation. Write everyone’s responsibilities down. Formulate three main ethical objectives everyone agrees on. Make sure everyone knows what they mean. Write down (an updated version of) the design goal as agreed upon by all stakeholders.